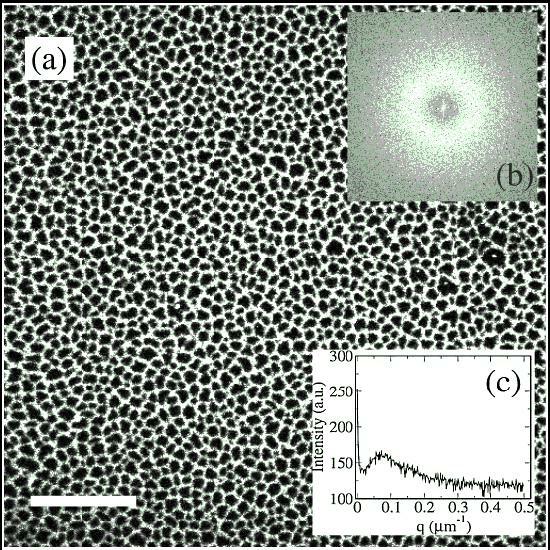 Colloids in Electric Fields: Tunable colloidal phase transitions. Soft matter is characterized by the importance of fluctuations and the ease with which one can control structure with external fields. We use the sensitive interplay of soft matter to external fields to control the interaction forces in colloidal systems. Static structure in three dimensions is obtained via fluorescence laser scanning confocal microscopy, and analyzed quantitatively using image processing software. We also study real-time dynamics and phase transition kinetics in micron-scale colloidal systems. The example shown here is an equilibrium phase formed in the presence of an electric field at very low densities (less than 1% solids fraction) that consists of a percolating particulate network that completely surround "voids" (particle-free regions) in an electric field. Each white dot in the figure is a chain along the field direction (out of the page) -- Phys. Rev. Lett. 2009. To understand the origins of these structures, we are measuring experimental equations of state for colloids in electric fields, and working in close collaboration with computer simulated equations of state (M. Valera and I. Saika-Voivod). -- Soft Matter, 2009.